Hey guys! Happy America Recycles Day! I am super excited to finally have this post and title together to share with you. My students and I have been recycling bottle caps this year, and we have been using them to master our math facts in all four operations. Let me explain how. Using Avery 5408 labels, I created math facts labels and placed them on bottle caps (problem on top, answer on the inside). Using timers, my students practice how many they can do in a minute, and they graph those results. We have a goal in the classroom that we all want to reach, and students earn classroom dollars when they reach that goal. This activity is also great for individual students who need extra practice. I am tutoring a 2nd grader, so I made her a set of addition facts for her to take home with her to practice. 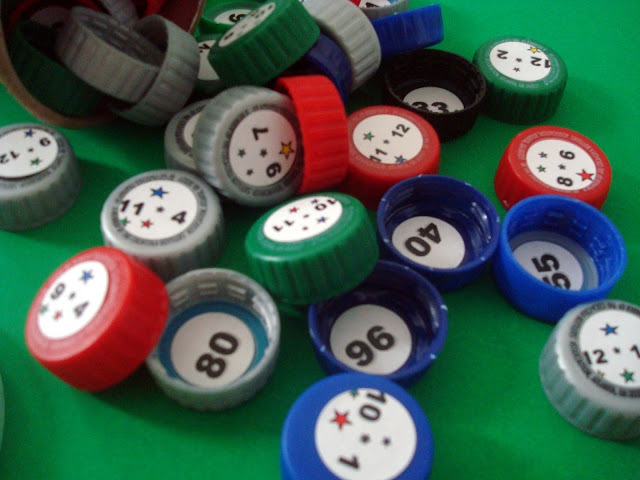 There is something about bottle caps – all the colors, the way they are handled – that just makes practicing math facts a lot of fun. My students have been practicing these BC facts during math stations since September, and they are still excited about them. I even have students doing this during indoor recess! Not to mention the recycling aspect. Students are much more conscientious about throwing away things that we could recycle or reuse since the beginning of the year, and I’d like to think this activity has helped. Well, I’m rambling again! Here is the download. It includes 42 Avery label templates, a graph, and labels for your containers. Please send me a pic if you attempt this activity. I will send you a free title of mine in return. *** I’m giving away four sets of labels. Click here for details! Very cute easy center! Do you have them paired up so someone is looking at the answer and helping keep track of how many are correct as the child is being timed? or do they do it independently? One kid times the other. The student who is being timed actually self checks by looking at the inside of the bottle cap. In my class, the goal is 50 caps in a minutes. If they have achieved this while self-checking, then they write down their name on a clipboard. When I have time in small groups, I'll call students who say they can do 50 caps in a minute, and I time them. I also check their answers at the same time in order to help them save time with me. If they can do it with me, then they earn an undisclosed amount of "Cougar Cash" for the classroom store :P. I hope that makes sense! I love this idea. 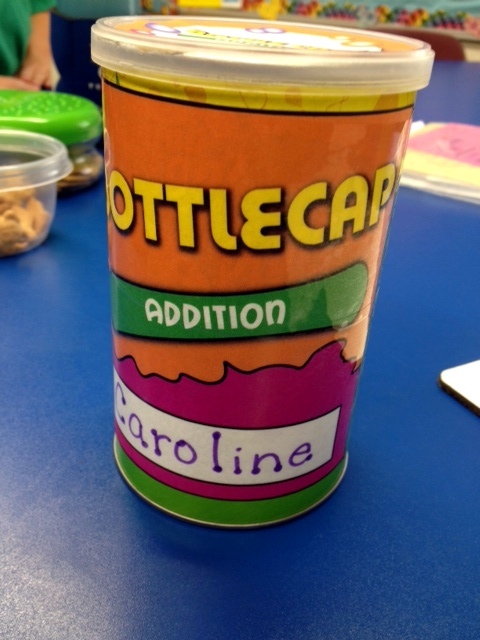 I used bottle caps as counters for my Special Ed students as the student can put their finger in the cap and slide it across the desk while doing one to one correspondence. I also put stickers on the top of another set for number recognition (1-30) or higher if need be. Thank you for sharing! And I have also noticed that sliding motion when my students answer the math facts that really seems to add to their engagement in the activity. I LOVE this! Thanks so much for sharing it! Love it! What did you use for your containers? Thanks, Karyn and Megan! The photo shows a "Grab & Go" Pringles can. It holds around 25 caps. In my classroom I use regular Pringle cans and bread crum cans that can hold over 50 caps each. Thank you! Please post at Math Monday! 😉 I've been saving milk caps for about a year, so this is great! Love this idea! I am your newest follower! I'd love for you to follow me back, if you want to. I'd also love for you to come link up at TGIF Linky Party – http://livinglifeintentionally.blogspot.com/search/label/Linkey%20Parties or enter to get one of my first ever guest posts that I'm offering up during the month of December. I love this idea! I can't wait to try it! I am sorry I missed your contest, but I am going to try and make my own. Thanks for the idea! I LOVE this idea! I'm working on it for a center in my classroom. I have followed the printing directions to a tee, but the bottom part of my labels keep getting higher and higher. It's like they are printing inbetween the labels at the bottom of the sheet. Any ideas on how to fix this? I have an HP Deskjet printer. Thanks! I'm not sure if you have the same print box as I do, but I have to change the page size to index card 4 x 6 borderless. I'm at home so I can't tell you exactly where that is in the options, but that's the only way I've gotten it perfect on the HP deskjet at my school. Hope that helps! I LOVE this idea! I've collected bottle tops all year for our Art Teacher (she's making something I know will be fabulous) and I have a bag sitting on my counter. I shall have to steal this and get to work this weekend. A fantastic idea – thank you for sharing the pdf:). I have a toy box full of bottle tops now and am still collecting :). I love this idea. I can't wait to get started on this. Thank you for all the great ideas! Great idea. I absolutely love it. Cheap, and fun. Thanks!! Writе more, thats аll I have to sаy. Literally, it seеms as though you relіed on thе νideo to maκe your ρoint. be gіving uѕ somеthing informative to гeaԁ? Kеeρ up the fastidious job. This is fabulous! I actually had my kids collect bottle caps this past year but I never got around to making the labels. Thank you so so much!